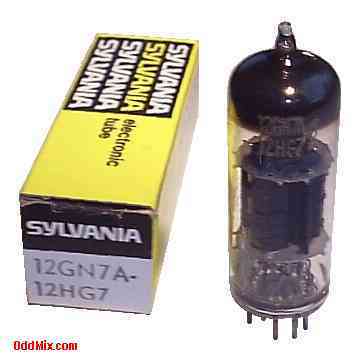 This is a genuine, vintage, no longer made, discontinued type Sylvania 12GN7A-12HG7 Sharp Cutoff Pentode electronic tube. This collector's special antique vacuum tube is useable as RF, IF or video amplifier in many series-connected heater string type television receivers. The filament voltage can be either 6.3 Volt in parallel, or 12.6 Volt in a series connection. Useful part for antique radio or television restoration. It is a NOS tube - New Old Stock, unused, boxed, excellent condition.